Table Tennis NSW claimed two GOLD MEDALS and one SILVER MEDAL in Latrobe Churchill, Victoria, as the Teams Events wrapped up on Wed 10 Apr 2019. NSW player, Alice Lee, also claimed a SILVER MEDAL as a member of the President’s Team in the Under 21 Women’s Team event. Men's Teams: Gold - NSW (Kane Townsend, Chris Yan), Silver - Victoria (Dave Powell, Heming Hu, Xavier Dixon), Bronze - Victoria B (Dillon Chambers, Nicholas Lum, Ma Lin). Women's Teams: Gold - Victoria (Jian Fang Lay, Lina Lei, Qian Yang), Silver - NSW (Michelle Bromley, Tracy Feng), Bronze - Queensland (Min Hyung Jee, Matilda Alexandersson). Under 21 Men's Teams: Gold - NSW (James Kim, Hwan Bae), Silver - President's (Tim Huang, Leo Li), Bronze - Victoria (Matthew Avers, Richard Li). Under 21 Women's Teams: Gold - Victoria (Parleen Kaur, Michelle Wu, Chermaine Quah), Silver - President's (Tahnee Green, Alice Lee), Bronze - President's B (Mia Psihogios, Connie Psihogios). Congratulations to Kane, Chris, James, Hwan, Michelle, Tracy and Alice. Vivian Table Tennis Academy is offering an intensive holiday training squad for juniors who are interested in playing at a competition level. This 4-day intensive program will target the key growth areas of Table Tennis and focus on technique, strategy and physical fitness. About Vivian: Vivian Tan is a former Olympian and Commonwealth Games representative for Australia. She was a Commonwealth medallist in Glasgow and won 2016 ITTF- Oceania Cup. Vivian is passionate about coaching and ensuring there are pathways for juniors to develop into elite competitive athletes. Numbers are strictly limited for this intensive program, to ensure we maintain the quality of the sessions. Want to see our NSW players in action at Latrobe Churchill, Victoria, from the comfort of your chair? Tune in to the Live Streaming on Wed 10 Apr and Sat 13 Apr to see our NSW players competing for medals in the Teams Events and the Individual Events. See Table Tennis Australia’s post below for times and connection details. Livestreaming will be available on the TTA Facebook page and TTA website tomorrow 10 April and Saturday 13 April. My Sport Live as the Official Broadcast Partner will provide coverage. - Wednesday 10 April, 9.00am-9.00pm AEST: Men's Team and Women's Team events later rounds and medal matches. - Saturday 13 April: 9.00am-2.30pm AEST: Men's Singles and Women's Singles medal matches. A star studded cast will assemble in Latrobe Churchill, check out some of the names who’ll be hunting national titles! Women: defending champion Minhyung Jee, 7 times Commonwealth Games medallist Jian Fang Lay, Commonwealth Games gold medallist Melissa Tapper, Commonwealth Games representatives Michelle Bromley and Tracy Feng, rising stars Parleen Kaur and Michelle Wu, plus multiple Paralympic Games gold medallists Qian Yang and Lina Lei. Men: Aussie number 1 Heming Hu, defending champion Chris Yan, Olympic Games and Commonwealth Games representative David Powell, Commonwealth Games representative Kane Townsend, defending Under 21 champion Rohan Dhooria, the always dangerous Bruno Levis, young guns Finn Luu and Nicholas Lum, multiple Paralympic Games gold medallist Ma Lin, plus Rio Paralympic silver medallist Sam von Einem. TTA is pleased to announce that Mr. Noel Shorter has been awarded Life Membership of TTA for longstanding and valued service to table tennis in Australia. Noel’s nomination for TTA Life Membership was unanimously supported by the State and Territory Associations at the TTA AGM on Saturday 30 March 2019. Noel started his table tennis career as a player in 1955 in Sydney, but it was as a coach, businessman and entrepreneur that Noel’s table tennis legacy was created. As a coach, Noel oversaw the development of multiple athletes to win countless National Titles and become internationally successful, most notably the golden generation of the Men’s National Team including Paul Pinkewich, Steve Knapp and Bob Tuckett (this team rose to number 12 in the world). Plus many others including Gary Haberl, Dennis Makaling, Russell Lavale, Greg Thomas and Ann Middleton (nee McMahon). Noel was also coach of the Australian team that travelled to China in 1971 as part of the famous ‘Ping Pong Diplomacy’ tour. As a businessman and entrepreneur, Noel established Combined Sports Traders in 1971, which in its day was arguably the biggest table tennis company in Australia. Although Noel is no longer an owner of the business, he still works part-time for the company, which is now under the name of Aussie Table Tennis. Combined Sports Traders and Aussie Table Tennis generously supported countless athletes over the years with equipment sponsorships. 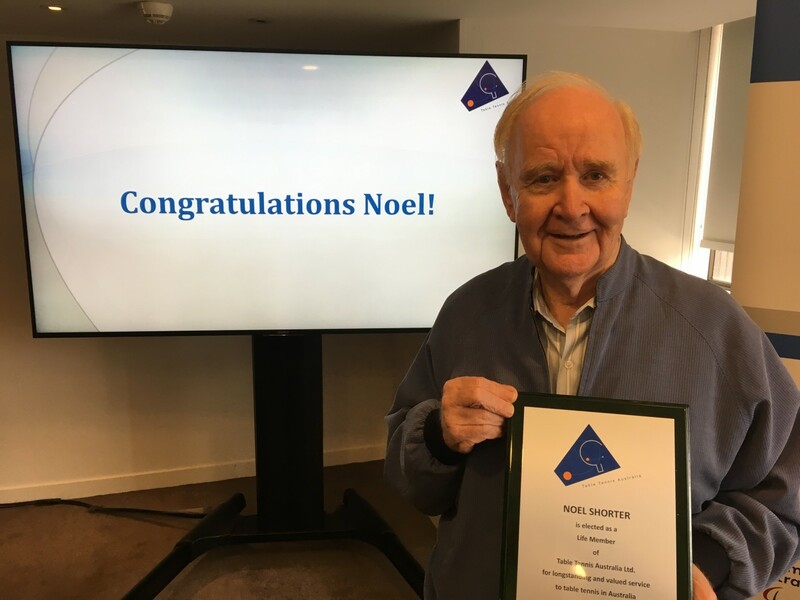 Noel founded the Wills International Tournament in 1977, which aired on ABC television for 16 weeks and significantly boosted interest in table tennis in Australia. The event attracted multiple world champions to compete, substantial spectator attendances and one year was even played at the Sydney Opera House. Noel was an owner of the Sydney Smashers in the National League of the 1990’s, a successful team that won the competition and drew record spectator numbers. Noel also served as a National Selector, National Team Manager and as a Technical Advisor at the 2000 Sydney Olympic Games. Congratulations Noel, you’re a worthy recipient of TTA Life Membership. To view Noel’s full bio, please click here.